Help protect you and your family with a Crystal Quest® showerhead water purifier in every shower. Unfiltered shower and bath water can double exposure to chlorine by absorption through the skin and by inhalation of chlorine vapors. 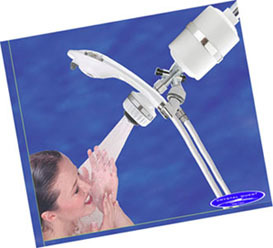 CRYSTAL QUEST® showerhead water purifier filters chlorine for softer hair and smoother skin. Now you can fight brittle hair, dry skin and dandruff where health and beauty begin right in your shower and bath. Chlorine vaporizes in hot shower water and, when inhaled in the lungs, is transferred into the blood stream. Scientific studies have linked chlorinated water to potentially harmful by-products that can, over time, contribute to such health threatening conditions as cancer of the bladder, liver, stomach and colon. Heart disease, high blood pressure and allergies have also been linked with chlorine. CRYSTAL QUEST® showerhead water purifier and CRYSTAL QUEST® Bath ball can help reduce these risks so you can breathe easier. CRYSTAL QUEST® Luxury showerhead water purifier is the most advanced shower filter on the market. Removes chlorine, chloramines, VOC's, THM's, pesticides, sulfur, heavy metals, hydrogen sulfide ("rotten egg" odor), iron oxides ("rust water"), dirt, sediment and other odors..... and it's pH balanced!! It works in the shower by filtering the water through two stages of KDF and Granular Activated Carbon(GAC**). The result? The healthiest, most refreshing shower experience ever. It's like showering in spring water! **Granular activated carbon is a highly adsorbent material used to remove contamination from water. Activated carbon has been known as a miracle filter media by many researchers because of its unique ability to remove offensive tastes, odors, color, chlorine and volatile organic chemicals, pesticides and trihalomethanes (a group of suspected carcinogens). Briefly, activated carbon acts like a sponge, with a large surface area to absorb contaminants in the water. The surface area of one pound of activated carbon is equal to 125 acres. Many scientists believe this is a result of an affinity that these chemicals have for carbon because of Van Der Waal forces. Activated carbon is the preferred treatment and method recommended by the EPA to remove a host of potentially hazardous and possibly carcinogenic chemicals in drinking water. CRYSTAL QUEST® Luxury Shower Power will give you smoother, softer skin and hair that is less dry. Your tub and shower area will be cleaner too! The unique drop-down filter design allows for a substantial amount of filtration media enabling more contact time with the water. More contact time means better filtration. This design also allows for more head room than most other shower filters. Replaceable cartridge makes maintenance simple and affordable. CRYSTAL QUEST® Luxury showerhead water purifier contains a reversible filter cartridge which lasts about a year. This high performance shower filter combines easy operation and maintenance with the ultimate in structural integrity and overall reliability. In fact, CRYSTAL QUEST® Luxury Shower Power is the strongest replaceable shower filter available on the market today. It can be easily changed and operated in either direction. Periodic reversing of the cartridge not only ensures balanced filtration and eliminates the potential for channeling, but also back-flushes the cartridge as it is filtering. Water travels down through the center tube, then passes through the KDF media for de-chlorination and enhances pH balance. Next, the water travels through the GAC (granular activated carbon) stage to reduce contaminants and finally exits through the shower head. Conveniently provides 1 year of filtration. CRYSTAL QUEST® Combo Luxury showerhead water purifier system combines the ease and convenience of showering with massage showerhead or a handheld shower and peace of mind from showering in filtered water. Great for shampooing and bathing children and pets. Maximum mobility with a 5.75 foot Duro-flex hose. Easy to install and change cartridges. The attractively designed shower handle has a 3-way adjustable massaging spray and a reversible filter cartridge. CRYSTAL QUEST® Combo Luxury showerhead water purifier system is the most advanced shower filter on the market. Removes chlorine, Chloramines, VOC's, THM's, pesticides, sulfur, heavy metals, hydrogen sulfide ("rotten egg" odor), iron oxides ("rust water"), dirt, sediment and other odors..... and it's pH balanced!! It works in the shower by filtering the water through two stages of KDF and Granular Activated Carbon. The results? The healthiest, most refreshing shower experience ever. It's like showering in spring water! CRYSTAL QUEST® Combo Luxury showerhead water purifier system will give you smoother, softer skin and hair that is less dry. Your tub and shower area will be cleaner too! The unique drop-down filter design allows for a substantial amount of filtration media enabling more contact time with the water. More contact time means better filtration. This design also allows for more head room than most other shower filters. 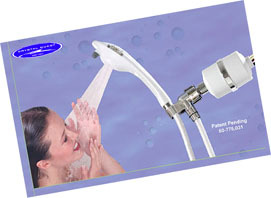 CRYSTAL QUEST® Combo Luxury Shower filtration system contains a reversible filter cartridge, which lasts about a year. This high performance shower filter combines easy operation and maintenance with the ultimate in structural integrity and overall reliability. In fact, CRYSTAL QUEST® Combo Luxury Shower filtration system is the strongest replaceable shower filter available on the market today. It can be easily changed and operated in either direction. Periodic reversing of the cartridge not only ensures balanced filtration and eliminates the potential for channeling, but also back-flushes the cartridge as it is filtering.